There is often a lot of talk and planning going on at Lizzie's Arty Crafty, or a lot of "gunna do" (say that last phrase with an Australian accent) but not always action. 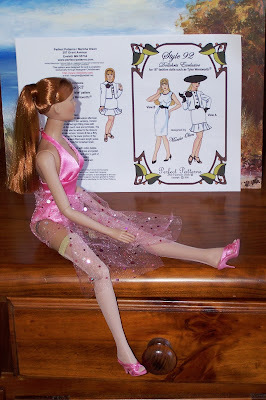 I got this Tonner doll a couple of years back and got a pattern to make an outfit for her, but never progressed any further except to tie the spangled tulle around her hips. She came in the pink halter neck swim suit which is quite nice but I am sure she would like a change. 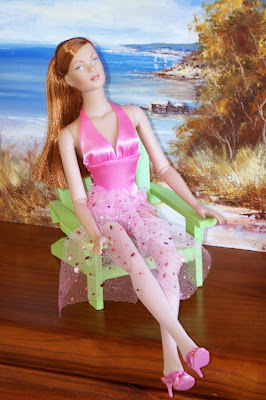 Audra and I have been comparing Tonner dolls, and after she blogged about her amazing thrift store find, I said I would blog about my doll (which was just an ebay purchase) so she could see what my one looks like. I checked the Tonner website as advised by Audra, but could not really say for sure she was a Tyler Wentworth. 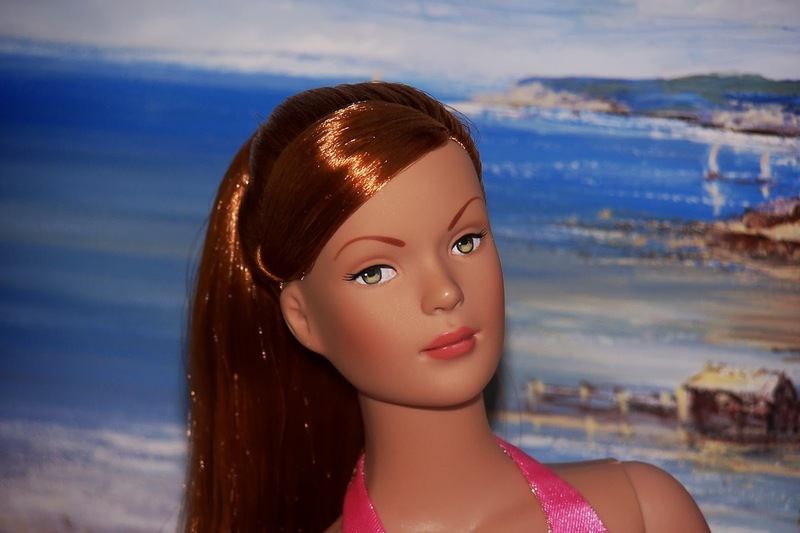 I looked on ebay and saw a Tyler Wentworth Signature Style doll who had much the same face, but I would prefer to get the information from the Tonner site as then I could be 100 percent sure. Then after all those exhausting searches, I remembered that she came in the pink outfit, so maybe it was tagged - and it was! TW in very swirly letters was printed on the tag. Audra gave me the contact details for Tonner, so I think I will send a photo of my doll in and get her identified 'officially'. I said to Audra that I didn't think she had a nice expression on her face as her doll does, but looking at the photos she isn't that bad. Maybe she is cross sometimes because she has been wearing that gaudy pink swimsuit for so long! Here are some front and back shots. She has a twist waist and can also twist mid torso! Now for the Bratz dolls part of this "gunna do" post. 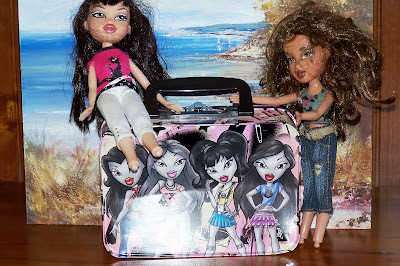 I was op-shopping today (yes, yes, I said that I was cutting down), but something made me get this bag-o-Bratz dollies. I don't particularly like Bratz dolls, but the thought of a dolly makeover challenge made me decide to get them. I couldn't really see what exactly was in the bag but when I got home and opened it I was pleasantly surprised. Bratz dolls are actually quite well made. Their hair is abundant and rooted and their face paint isn't too bad. I will try washing and conditioning their hair, and if that is no good, I will get some of the Twin Pines hair products for dolls. 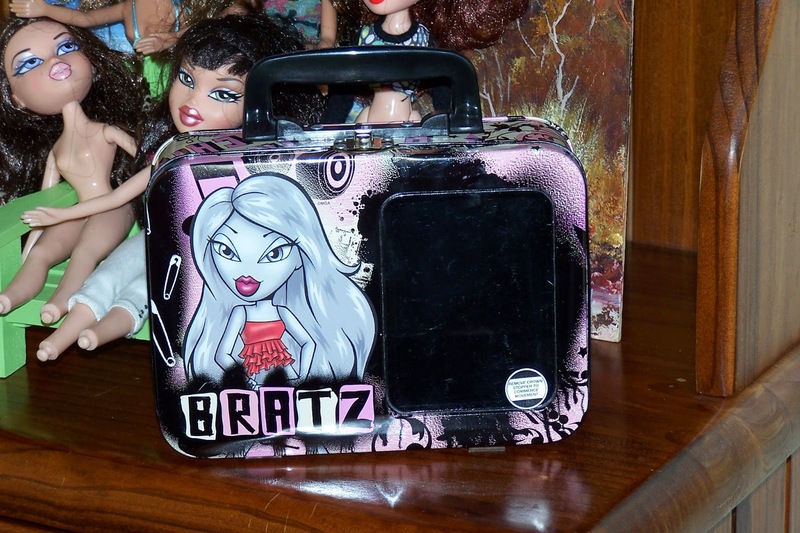 I don't really take much notice of Bratz dolls, but I do know they come in these edgy urban styles. Some of the dolls that I got have all or some of their outfits but I am thinking of how I can give them a different not so trashy look, perhaps using Simplicity 0382. They are all missing the lower part of their legs, so that is where ebay will come to the rescue! I also got this little carry case that hasn't got a scratch on it. It has a clear window which I don't think has photographed very well. I couldn't stop the flash from reflecting off the back of the tin. Your comment made me laugh about the doll being upset for waiting so long for her outfit... :) I really admire your skills, I so would not have the patience to sew outfits that are so small and fiddly! She doesn't look cross so much as very serious (yes, probably because she's wondering if she'll ever get any new clothes). But I know you'll make her something wonderful. The Bratz girls sure look happy to be released from their bag. Maybe you can do face repaints to make them look a little less trashy (but I think they like that look). 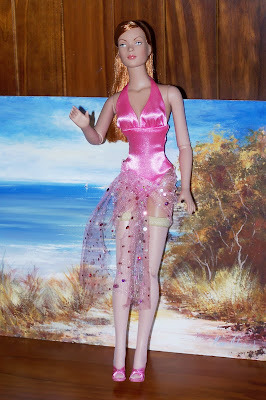 Thanks Laura Lee, it nearly killed me making an outfit for my 8 inch Virga doll recently. Yes, I think the Bratz like the trashy look Audra. I have never tried to do a repaint, something to think about.